Willie Mullins made inroads into Gordon Elliott's title race lead on Thursday, but the defending champion was left to reflect on what might have been after narrowly missing out on the feature race at Punchestown for the second successive day. Following Djakadam's short-head reversal in the Punchestown Gold Cup on Wednesday, lightning struck twice for Mullins as Nichols Canyon lost out by a head to Unowhatimeanharry in the Ladbrokes Champion Stayers Hurdle. The difference between first and second in both races was €100,000. It was still a productive day for Mullins as he passed the €4 million prize-money mark for the season and reduced Elliott's advantage to €126,830 with two days to go. 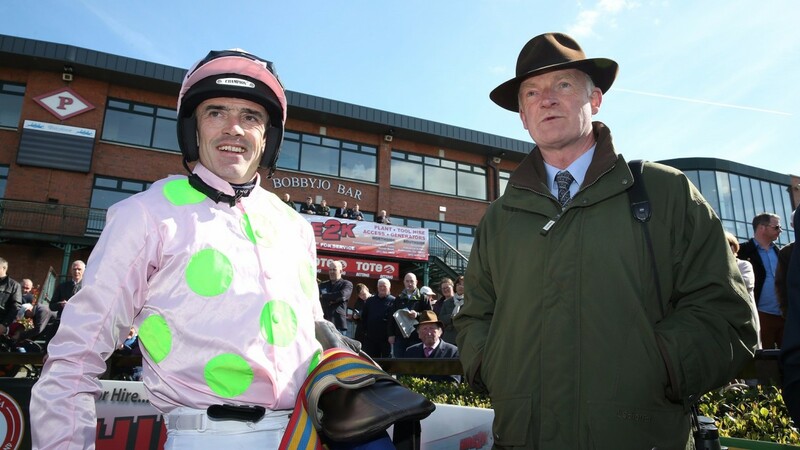 Paddy Power cut Mullins to 11-10, while Elliott was eased to 4-6 as the battle goes down to the wire. After saddling Nichols Canyon and Footpad to finish second and third in the Champion Stayers Hurdle, Mullins bagged a crucial success in the day's other Grade 1, the Ryanair Novice Chase, as Great Field scooped the €67,850 winner's pot. The trainer was then responsible for a 1-2-3 in the mares' novice hurdle as Asthuria provided stable jockey Ruby Walsh with his first winner at the meeting. Regarding the title tussle, Walsh said: "We're in shooting distance and we're not going to stop. We just needed one of Nichols Canyon, Djakadam or Un De Sceaux to go our way. Gordon has set some pace and will probably get it off us, but we're not going to give it to him." Mullins and Elliott have some big guns still to fire and are mob-handed on Friday's card. If the battle does go down to Saturday then there could be more than a hint of irony as Elliott is set to saddle likely short-priced favourite Apple's Jade, formerly trained by Mullins, in the €100,000 Mares Champion Hurdle.